Kompyte’s Paid Campaign Watch displays all the AdWords your competitors are running. Select any Ad to see the complete Ad including Kompyte’s proprietary Search Ad Performance Scoring - AdScore. Based on your competitors’ AB experiments and behavior, Kompyte’s proprietary Ad Score shows you which of your competitor’s ads are consistently converting potential customers. When an ad is selected you can tap Show Details and a tabbed pop-up appears with options to view the ad’s correlating landing page or show the ads history. 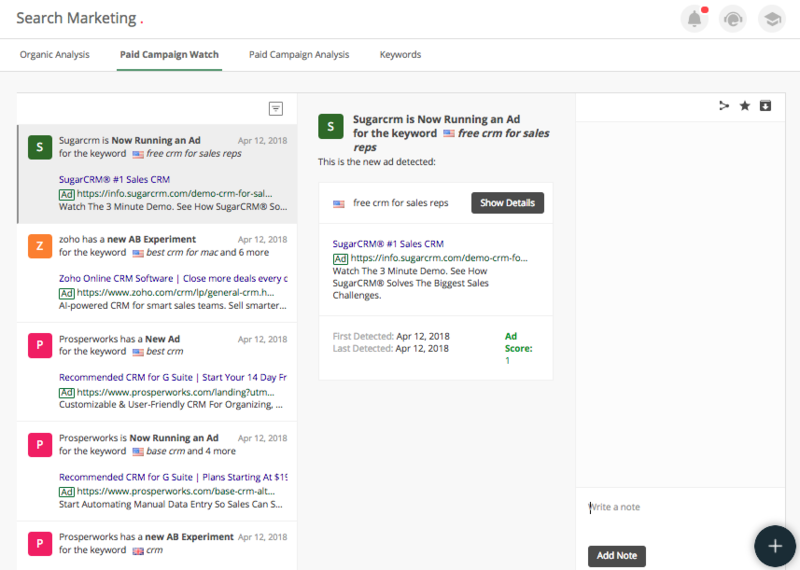 How can I filter ads in Paid Campaign Watch? How can I share an ad Kompyte has detected? How can I highlight an update in Paid Campaign Watch? Which posts should I highlight? How do I sort AdWords detected or tag a team member?